The tropical deluge Hurricane Arthur dumped on the U.S. East Coast was as nothing to the deluge of rumors dumped by the iOSphere, most of them dealing with parts. Mockups were triumphantly presented as proof of at least a "rough idea" of the final iPhone design. And then there were parts: both external and internal, though the really important questions about both went not only unanswered but unasked. And a Reliable Source "confirmed" what almost everyone has known since September 10, 2013: that the iPhone 6 is probably going to be announced in September 2014. "Rumors and past release date info have thus far pointed towards a September launch date for the iPhone 6, which has now been confirmed by a reliable source that spoke to MacRumors." A Japanese website posted a confusing (at least confusing in the Google Translate English version) story that is being widely interpreted in the iOSphere as, somehow, confirming that the various iPhone 6 mockups for the rumored 4.7-inch model actually do give a "rough idea" of the final product. That would seem to be a logical impossibility since to know whether a mockup was even a rough copy of the final product, you would have to know what the final product actually looked like. And, of course, we don't. Our Google translation of the Nikkei.com original Japanese post renders the headline as: "iPhone6 is 'thin, round' validate the model made in China." The headline at GForGames, one of the first to pick this up, interprets this as "iPhone 6 Mockups Found To Give A 'Rough Idea' Of The Final Product." Mihai Matei reassures his readers: "Well, Nikkei's sources have recently shed more light on the matter, and informed us that the mockups can indeed give a rough idea of the final product." 9to5Mac's subsequent headline interprets the GForGames headline as "iPhone 6 mockups are a 'rough approximation' according to report, claims antenna design will differ significantly." According to Benjamin Mayo, "As translated by GforGames, the report says that while the mockups offer a good estimate of the final design, some key details are omitted." So what did the Nikkei.com "report" actually reveal? The post's author, Hiroshi Maruo, writes "This mock-up, I got from the mail order site of China dealing with repair parts of the iPhone." Based on this treasure, Maruo explains that "In this article, and people in regard to making things Apple, along with the designer and manufacturer of competing with Apple design information such as through contract manufacturers, I explore the direction of the design of the iPhone." Technically, he means "I explore the direction of the design of anonymous third-party mockups of the iPhone." Most of his post is a catalog of how rotten is the quality of the mockup he obtained. The surface is "gritty rough." There is an "unwanted bulge," and "visible trace of burr holes," all completely lacking in the "polite polish characteristic of Apple products." And "it was also full of gap distance between the hole and the button." "Still, Taken together the opinions of designers and manufacturers of competing person involved in making things at the beginning, could have a rough design become this street even iPhone 6 the actual 's high likely," according to Maruo. So despite the fact the mockup comes from an anonymous Chinese mail order repair site, and is of crappy quality, yet still somehow it is actual's high likely to give a rough design of the iPhone 6. And "Last but not least," according to GForGames' Matei, "the source has also mentioned that the white stripes found on the back panel of the mockups are not going to be part of the final design. For now they might only mark out the area where the back panel will "break" into multiple pieces, similar to the iPhone 5S." What he means is that the back of the 5s looks like this, with ceramic glass inlays at the top and bottom, while the mockup-with-lines looks like this. The fact that, less than three months before the expected iPhone 6 announcement, the iOSphere is "debating" the meaning of lines in mockups from who knows where shows how little is actually known about the next model. Or models. The really amazing thing about this is that it's being treated as "news," even by the Internet's debased meaning of that term. "Rumors and past release date info have thus far pointed towards a September launch date for the iPhone 6, which has now been confirmed by a reliable source that spoke to MacRumors," writes Juli Clover, in a post at MacRumors. The headline to Clover's post -- "Apple Expected to Announce iPhone 6 in Early September, With Launch Later in the Month" -- actually could have been written on Tuesday, September 10, 2013, the day after the iPhone 5c and 5s were announced. Ever since, the most reasonable expectation has been that Apple would announce the 2014 iPhone 12 months after the 2013 iPhone. Clover gives us no indication of why she considers her source "reliable," and therefore no evidence to persuade her readers to do so. The rest of the post is an exercise in "if A, then B and C." If the phone ships in late September, then lots of them have to be available to, you know, ship. "Mass shipments of the iPhone 6 from China to the United States are expected to occur during the last two weeks of August and it is likely that Apple will announce the iPhone 6 during the first or second weeks of September," Clover deduces. "The first deliveries of the device will come later in the month on a corresponding Friday, roughly a week and a half after the event." The last sentence simply summarizes Apple's most common practice so far: announcing new models on a Tuesday or Wednesday and making them available for purchase on the second Friday after the announcement. Which we more or less knew on September 10, 2013. 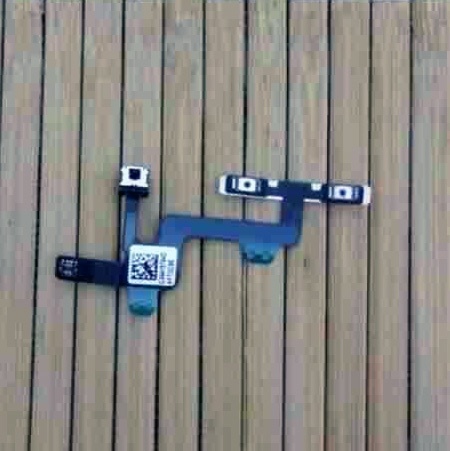 A glass panel, purporting to be the front of the 4.7-inch iPhone 6, was revealed at 9to5Mac using photographs supplied by Australian Leaker Sonny Dickson. Dickson, as of this posting, has apparently not yet posted the photos on his own Website. Mark Gurman noted that while numerous "mockups" (not to mention endless "renderings" or fan art) claiming to show the iPhone 6 have been disclosed "actual parts for the display cover for the larger phone have yet to leak out." "Today, Sonny Dickson sent us several photos of purported display glass covers in both black and white variations for the 4.7-inch iPhone," Gurman wrote. If that sounds like a Big Deal, it's really not. "The images do not indicate any breakthrough new features for the next-generation iPhone, but the availability of these parts indicates that the new iPhone is nearing mass-production ahead of a launch this fall," Gurman wrote, confidently. As we've already seen, at this point almost every iPhone rumor indicates that the new iPhone is nearing mass-production ahead of a launch this fall. One of the photos from Dickson shows the iPhone 5s/5c front glass panel, at left, and the purported 4.7-inch iPhone 6 front panel at right. In case you're not sure, the one at the right is bigger. "The edges also appear to be slightly curved," says Gurman, which indicates how he, at least, interprets persistent rumors that Apple is experimenting with, or planning, or manufacturing "curved screens." To The Rollup, the Dickson photos seem to show a more beveled rather than rounded or curved edge. So, who knows? If Dickson actually has these objects he could test it himself. Or at least ask his source, who presumably has the glass panels, to test them, even if all either of them did was to rub it with a chunk of concrete. That test potentially would reveal at least one breakthrough feature. BGR's Zach Epstein is certainly impressed, and showed it with a blaring headline: "New leak shows internal iPhone 6 parts for the first time." "Apple fan blog Apple.club.tw found three images on imgur.com on Tuesday that supposedly show two internal components from one of Apple's upcoming next-generation iPhones," Epstein writes. "The first is a cable that holds the volume and mute buttons and connects them to the iPhone's main board, and the second is a separate flex cable that appears to hold the iPhone 6's power button." None of the links to the Apple.club.tw site currently take you to that page. The Chinese portion of the URL translates as: "First exposure iPhone6 [power?] switch and volume cable." The three photos, if they are photos, posted on the image-sharing site Imagur are labeled simply as "iPhone6 parts." Such exposures create a certain thrill but it's a passing thrill since very few people are in a position to know exactly what the parts do, or are claimed to do, or how they compare with the previous model's exposed parts, or what the differences might actually mean. Epstein gives it the old college try: "Of note, all of the aforementioned buttons on the iPhone 5s were found on one flex cable," he explains to readers. "The possibility that they have been moved to separate cables may further support earlier reports [he means "rumors"] suggesting that the location of the power button has been moved from the top of the handset to the side on the iPhone 6." 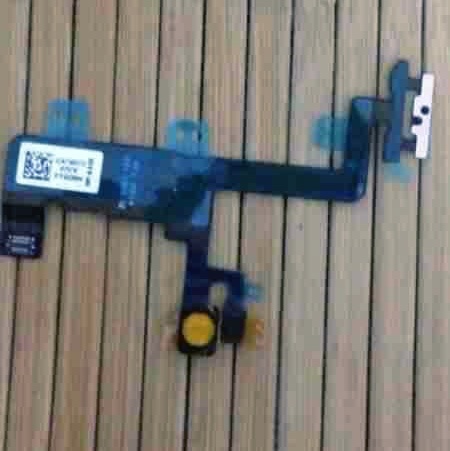 Here's one of the not-very-good photos showing the alleged volume/mute flex cable and a second not-very-good photo showing the alleged power button flex cable. MacRumors' Eric Slivka expressed the same hivemind opinion in his own post. "This change would seem to be consistent with the larger size of the iPhone 6 and the reported [he means "rumored'"] shift in the location of the power button from the top edge to the right edge," he explains. Given that the only source is an anonymous posting of three images that someone has labeled "iPhone 6 parts," this is another rumor, all too common in the iOSphere, where there is much, much less to it than meets the eye.